After a very full English breakfast, we stepped out into a fine morning in Malham and headed along the lane to the start of the climb to the top of Malham Cove. The top of the cove is accessed by a steep, stone staircase that climbs to the left of the cliff, which was a rude awakening so early in day. 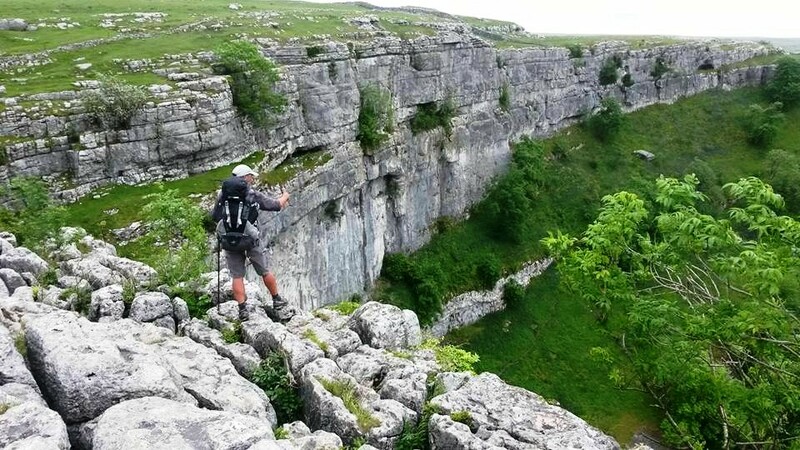 This impressive, two hundred and fifty foot limestone cliff is topped with an equally impressive limestone pavement. This large, limestone platform is crissed-crossed by narrow channels called ‘grikes’, cut into the limestone by the erosive action of rainwater and leaving small islands in the stone known as ‘clints’. We walked carefully over the potentially ankle breaking pavement to the edge of the cove and peered over the dizzying drop to the path we had climbed up from below. I felt extremely fit and energetic and the view to the riverside path below on this fine morning had a very liberating effect and I looked forward with anticipation to the days march into the Yorkshire Dales, on this, one of the finest days walking on the whole Pennine Way. As we turned and headed up the narrow defile of Watlowes dry valley, I wondered what the valley and cove would have looked like in times long past when Malham Beck flowed above ground along the valley floor we now walked along, before tumbling over the huge drop of the cove and into the streambed below. The curious characteristic of limestone country is that over time, rivers erode the limestone riverbed and eventually disappear underground before re-appearing further along it’s course. In this case, the river had disappeared underground before re-emerging at the foot of the towering cliffs. We climbed easily up and out of the valley in impressive rock architecture and eventually emerged into open country next to a small, metalled lane which we crossed before reaching Malham Tarn. The tarn is something of a geographical oddity as it is one of only eight alkaline lakes in Europe and it looked very placid as we skirted around it shores on a pedestrianised path where we passed a few people out for a morning stroll before leaving it to head off across open country towards the day’s next objective, the summit of Fountain’s Fell. It was during the next section of the walk over Fountain’s Fell and Pen y Ghent that I noticed that Alan didn't seem to be at his best. Until now, we had been walking well, at a good pace with no real problems and although Alan had suffered a little with blisters and midge-bites, I had detected nothing to suggest that he was suffering from any other issues. However, as we climbed Fountain’s Fell, which is an admittedly long haul although not particularly steep, I noticed my friend regularly falling behind and making occasional, critical comments regarding the scenery we were walking through. These comments, although insignificant on their own, combined with the sudden drop in pace, alerted me to the fact that all may not have been well with my walking companion. As we headed for Tennant Gill Farm, two young walkers appeared on a low rise to our right and fell in behind us after a brief ‘good morning’. We climbed the short, very steep path from the farm and out onto the open fell and as we climbed, decided to pause for a short break for a drink. The two youngsters also stopped and after chatting a while, we ascertained that they had started walking in the Lake District before heading across to the Yorkshire Dales. They were now following a section of the Pennine Way before they headed off west once more with the intention of finishing their walk in Carlisle. We wished them well and they continued their climb before we shortly shouldered our packs once more and continued our climb. It was on this section that Alan fell behind regularly and I stopped every now and again to let him catch up. In fact, the two young lads that we had spoken to were now also walking separately as a large gap had also developed between them. Soon, we arrived at the tall cairns on the top of the climb as the impressive bulk of Pen y Ghent came into view across the valley. The two young walkers were slumped by one of the cairns and as we passed them, Alan confirmed with me that our route lay over the summit of Pen y Ghent, which highlighted to me that he was feeling the strain of the climb up Fountains Fell. I personally was enjoying myself immensely but tried not to sound too upbeat as I knew this can be annoying to someone not feeling at their best. As we began our descent to the lonely road on the valley floor, I marvelled that this was the second time I had walked this section of the Pennine Way in consecutive years in fine weather. In fact, the whole of the previous years truncated trip had been walked in almost perfect weather and yesterday’s morning of rain aside, this year was turning out to be similar. Surely, it couldn’t last? We reached the road and followed it for around a mile before heading off on a track to Dale Head Farm as the isolated peak of Pen y Ghent - the hill of the wind - towered over the surrounding landscape. We climbed steadily on a well-engineered path before crossing a wall to reach the start of the summit path, which by now looked almost vertical. The guidebook promised that the climb looked worse than it was and sure enough, after around twenty minutes of scaling the rocky, scree-strewn ‘ladder’ of a path, we were stood on the summit, enjoying the surrounding landscape and snacking on what food we had in our bags. There was a keen, chilly wind on the top that I was anxious to escape and it wasn’t long before we were crossing the wall through a small stile and heading down the path in the direction of Horton in Ribblesdale. The descent path, I knew from the previous year was an unpleasant route covered in much loose rock and debris so I followed the faint, grassy path to the right, which made for a much quicker, more comfortable descent. Alan had fallen into conversation with some other walkers on the main path and I met up with him again further down as we began the long three miles along a rocky track into Horton. In Horton, we headed for the Pen Y Ghent cafe, which also has a shop area selling outdoor equipment and we both purchased socks and snacks for the following day, as well as a huge mugs of tea and sandwiches, which we ate outside in the sunshine. As we sat, the two lads from Fountains Fell sat opposite us and during our conversation we discovered that they had omitted the climb onto Pen y Ghent and taken a direct route into the village. We finished our tea and wished them well on the rest of their trip and headed for the campsite which turned out to be a very well-run site with pitches for tents separated by ‘alleyways’ mowed into the long grass. We checked in with the campsite owner who was sat outside a large tent, which seemed to be furnished like an apartment inside and we pitched our tents and showered as Gordon and Rowan arrived and began setting up. There were a large number of DOE youngters on the site and I wondered if this would cause a problem with noise later on during the night but in the event they couldn’t have been more well-behaved. After we had finished our chores, we walked to the pub next door where we were met by Trevor and Barbara, two walkers I knew from my home in Tenerife where I had enjoyed their company on many walks and we enjoyed a meal and a few pints of real ale in their company before returning to the campsite.